Santiago Ramón y Cajal (1852–1934) is a conspicuous name among neuroscientists and microbiologists, but beyond these fields, he is little known. A Nobel laureate and the father of modern neuroscience, Cajal reached unparalleled heights of scientific discovery through his micro-anatomical observations. Bolstering these feats are his carefully prepared drawings, which he made during the hundreds of hours spent observing microscope slides. These drawings depict such phenomena as neurons, cortices, and synaptic contacts, and while they are certainly aesthetically pleasing, I argue that they offer much more than aesthetic beauty. I invite you, my readers, to view Cajal’s drawings not only as evidence of successful neuroscientific exploits but also as a series of portraits, focusing primarily on his depiction of a pyramidal neuron in the cerebral cortex (see fig.). My classification of Cajal’s images as portraiture by no means denigrates their status as scientific representations unrivaled in their clarity (so much so that they are still in use today, in medical textbooks, class lectures, and conference talks. I first encountered them in Dr. Wendy Suzuki’s NYU core course, Brain and Behavior, in spring 2017.). Explaining what I mean by portraiture is not easy. I first turned to the opening definition in Richard Brilliant’s book Portraiture: “Simply put, portraits are art works, intentionally made of living or once living people by artists, in a variety of media, and for an audience” (Brilliant 8). Based on this description, a drawing of a neuron does not qualify as a portrait; later in his book, however, Brilliant unravels the complex nature of portraiture as a genre. From the multiplicity of definitions presented in Portraiture, a common thread emerges: a portrait sustains a legitimate connection with a person. That said, what is a neuron’s relationship to personhood? Neurons serve as the ultimate controlling mechanisms of personhood and personality, elements of which are energetically pursued by portraitists; in a more physical sense, a neuron is a part of a human body; in a more literal sense, a neuron is not a person. In my struggle with the nature of personhood, I am not alone. Brilliant also noted the difficulty in demonstrating personhood in portraiture, especially in works such as René Magritte’s Baucis Landscape (Paysage de Baucis) (1966; Museum of Modern Art, New York) or Salvador Dalí’s Mae West (1933–35; Art Institute of Chicago, Chicago), where the subjects’ humanity is called into question; Brilliant claims that only an arbitrary connection need be established. Given the ambiguity of personhood, the only truly defining characteristic of a portrait is the artist’s considering it as such. Due to portraiture’s inherent subjectivity, we must allow Cajal himself to adjudicate the nature of his works. Were Cajal’s subjects scientific and lifeless experiments, or spirited and dynamic entities? While he perhaps never explicitly labeled his drawings as portraits, Cajal viewed his subjects as ostensibly animate, living beings, despite the fact that his preparations were usually dead tissues. Sir Charles Sherrington, the highly regarded physiologist and neurologist who hosted Cajal during a visit to London, observed his intensely anthropomorphic treatment of the microscopic scene. According to Sherrington, Cajal attributed animate qualities to these tiny beings, as if they were “actuated by motives and strivings and satisfactions not very remotely different from our own” (Sherrington xiv). Cajal himself, in his memoir which is dedicated as much to artistic pursuit as to scientific exploration, admitted to spending twenty continuous hours “watching the movements of a sluggish leukocyte in its laborious efforts to escape from a blood capillary” (Cajal 278). It is not outlandish, then, to liken one of Cajal’s industrious and intimate drawings of neurons—which he interpreted as feeling and doing as we do—to an artist’s portrait of a human being. His method was not unlike that of a portraitist; he made certain aesthetic decisions while hewing closely to the representation of his subject. Cajal drew attention to certain cells by enlarging them or darkening their color in relation to others, just as a portraitist will enhance a subject’s features to achieve a more benevolent or flattering representation. The fondness and calculation with which Cajal regarded his microscopic preparations suggests that to these neurons he attributed a certain degree of selfhood. Cajal’s drawing of a pyramidal neuron of the cerebral cortex most clearly resembles a conventional portrait in its frontality and emphasis on one individual being. A pyramidal neuron is a pyramid-shaped brain cell critical to the function of the cerebral cortex, the outermost layer of the brain, which is responsible for sensory processing, motor activity, and higher brain functions. When I first saw this drawing, I felt it exuded human qualities. 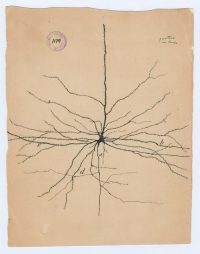 Here, Cajal singles out one pyramidal neuron, setting it against a plain background, depicting it solo to emphasize its characteristics; in reality, this neuron was surrounded by thousands of others. Axially symmetric, the neuron boldly extends a long dendrite upward, while its smaller dendrites, like arms, more demurely radiate outwards from the other points on its body. Dendrites serve as the neuron’s input centers, receiving communications from other neurons. A single axon, conducting signals away from the body, is identifiable by its lack of hairlike protrusions (called dendritic spines). It extends downward, modestly branching out in efforts to communicate honestly with other neurons. Cajal’s brand of portraiture is humbling; the pyramidal neuron has its own personality, yet within it is a universal portrait in which we can all see a part of ourselves. 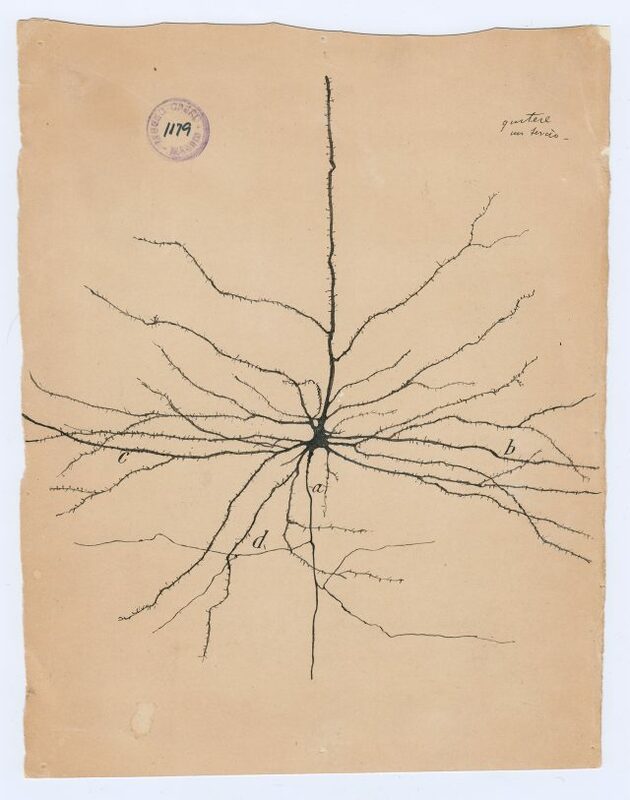 This “portrait” by Cajal of a pyramidal neuron in the cerebral cortex, along with many other neuroscientific drawings by him, will be on exhibition at NYU’s Grey Art Gallery in The Beautiful Brain: The Drawings of Santiago Ramón y Cajal, on view January 9–March 31, 2018. These drawings belong in an art museum as much as they do in a science or natural history museum, not simply because of their innate aesthetic beauty, but because, in addition to his impressive titles of Nobel laureate, father of modern neuroscience, and so on, Santiago Ramón y Cajal was a portraitist. Brilliant, Richard. Portraiture. Cambridge, MA: Harvard University Press, 1991. Swanson, Larry W., Eric A. Newman, Alfonso Araque, Janet M. Dubinsky, Lyndel King, and Eric Himmel, eds. The Beautiful Brain: The Drawings of Santiago Ramón y Cajal. Exh. cat. New York: Abrams, 2017. Ramón y Cajal, Santiago. Recollections of My Life. Translated by E. Horne Craigie with Juan Cano. Cambridge, MA: MIT Press, 1989. Sherrington, Charles. “A Memoir of Dr. Cajal.” In Explorer of the Human Brain: The Life of Santiago Ramón y Cajal, by Dorothy F. Cannon. New York: Henry Schuman, 1949. ix­–xv. Kelly Ryser is an undergraduate intern at the Grey Art Gallery. She is studying Urban Design and Architecture and Art History at NYU, and will graduate in spring 2019.